It’s nearly the end of the week here so it must be time for something tasty. Yes, it is still dark and cold outside after work and if you live in Auckland, New Zealand, it is most likely raining. I know you just want to blob in front of the TV, but this easy to make (I seem to say this a lot! ), healthy nuttyish slice will be so tasty in your lunch box tomorrow, you really do need to get off the couch and make it now. That’s my motivating speech or rather my excuse for baking yet another primal treat, maybe a bit lame I know, so tell me if you can think of a better reason!! • Line a 12 x 23cm (ish) baking tin with cooking or parchment paper. • Mix dry ingredients until well blended. • Melt the butter and honey or maple syrup together gently. • Pour over dry ingredients and mix well to combine. • Spoon the mixture into the tin and press down firmly and evenly. • Bake for 12 to 15 minutes or until golden. • Remove from the oven and allow to cool for 5 mins. • Gently place onto a cake rack (keep it on the paper for ease), and cool completely. 10 medjool dates, pits removed and chopped. 2 tbsp soft butter*, grassfeed. ¼ cup macadamia nuts chopped finely. • Soak the dates in the boiling water to soften for at least three hours then drain. • In a food processor blend the dates, soft butter and ginger until smooth. • Spread evenly over the slice. 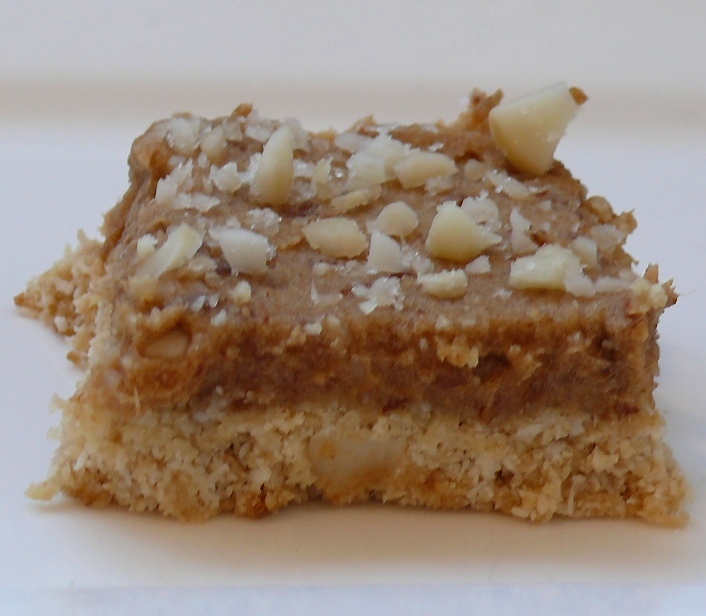 • Sprinkle with nuts and slice into pieces. • If you are storing for longer than a day then store in the fridge however, the base will soften but the crunch still comes from the nuts! *To make this dairy-free, just swap out the butter for coconut oil. Feeling like something chocolatey instead? 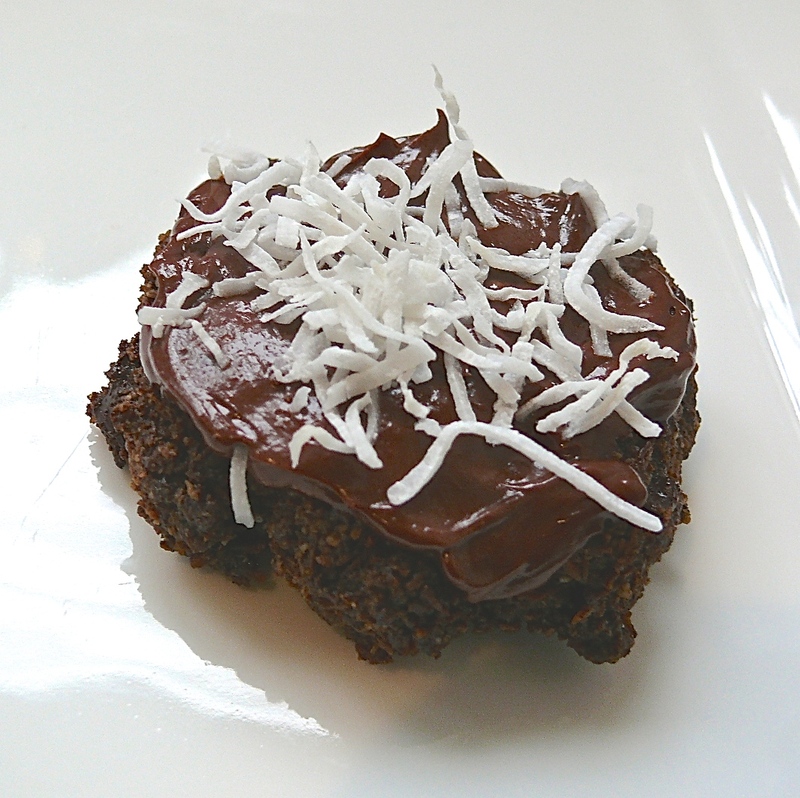 How about Double Chocolate Coconut Cookies with Bitter Chocolate Ganache?? Yum, I can confirm that these are great!